Need Inspiration for your papercrafting projects? Focus on smart, simple sophisticated Card making, Scrapbooking and papercrafting projects and materials for the busy papercrafter! AMuse Studio unmounted stamps, exclusive paper lines, cardstock, inks, embellishments, coordinating Papers, Cardstock, ribbons, and hardware to make it easy to put a project together. AMUSE Studio Creative Consultant Heather Scott - Scrapping and Stamping Ink-spirations from Oz-somestamps. Well this letter has been sitting in my studio just begging for some attention - and I finally found some time this morning while the fam was sleeping in! I started with your standard Paper Mache letter. I decoupaged dictionary pages to the front and painted the edges with black acrylic paint. Then I grabbed my stamps - some old TAC images and a few from Amuse Studio too. I stamped away with Pallette Noir ink - my fav! When I finished stamping I added the ribbon trim and pearls to both ends of the S. I also fashioned a flower from some burlap ribbon - LOVE!!! I made a bunch of those suckers when I was finished and will be adding them to my crosses soon. Now to find a spot for it in the living room! I started with a display easel from my demo days with A|S (the item is not available any longer I dont think but you can ask Seleise!) I stuck on a piece of Petite Dot paper that I distressed the edges of with a sanding block. I made a little box with the Chevron CS and attached it to the board with red line tape - I left a little extra room so the pen fits in there with the Post-it Notes too. I used simple button magnets and resin flowers for the magnets - E6000 for sure! I wanted to be able to cut it with one of my nesties so they would all be perfectly sized. That one goes from March 2014 to March 2015. So it has been forever since I posted on my blog - and I am not saying I am gonna get back to that but you never know! It is Spring Break so I had some time to get my studio cleaned up a bit so I can see my desk! It also helps that it is getting warmer so it is not arctic in there! I am planning an Angel Reunion in June 2014 - the first weekend in KC at the Four Points. Email me if you want to join us! This is the very first verse I ever memorized intentionally. It was at a Beth Moore Conference and it spoke to me then and everyday since! I have wanted to create a canvas with this verse ever since that day and I finally did it! I LOVE how it turned out and hope that it inspires you to dive into expressing yor faith in art like this! I say this because I did not do that - and mine bled! SO I just went over them with a pen after it was all complete but I would have prefered to have them not bleed! I cut out the words and sprayed them all with Papaya Splash from Amuse Studio. I chose the Authentique Blissful 6x6 paper pad. I also used my fav - dictionary pages! I decoupaged them all to my canvas with Mod Podge and then added a little Gesso on top just to soften them a little. Next I sketched in my she. This is probably the hardest most intimidating step - but it gets easier the more you practice! I sketched in pencil first on my canvas, then laid my bacground piece in top and re-sketched the dress shape on that paper. Then I cut it out and played with it til I got it the right shape. Next I took my flesh acrylic paint and filled in the arms and face of my sketch. Then I decoupaged on the dress shape and added the accent belt piece. I added the hair and shaded the face and arms a little. I decided to add some white trim and a collar to the dress so I just painted those in with white acrylic paint. After it was completely dry I went back in with my doodle pen and added all the details. You can see my pen added most of the details to the hair - the white highlights I added later. Next I placed all my words on my canvas and decided on placement. I wrote the "Whatever is" in first then stamped the arrows - from I was here stamp set from Amuse Studio. Than I decoupaged on the words themselves. While that was drying I decoupaged on some butterflies that I cut with my Butterfly Trio Dies from Amuse Studio. I also added a paper doily along the top edge. Let it completely dry - and then the fun begins! Doodling! It is basically scribbling with a purpose! LOL! You just want to define the shapes and pieces that you want to draw attention to. Here you can see it around the word pieces. Here you can see my doodling around the butterflies - and also along the edge where I added some white paint in a scallop shape. The doodling just set the elements off. You can also see here that I added some more stamped images. Modern Zinnia from Amuse Studio along the edge in Eucalyptus Ink (I did emboss the Zinnias with clear embossing powder just to add more texture) as well as Script Background from Amuse Studio with Tuxedo Black Memento Ink. I also used some old faves -my running stitches (TAC) and Punchinella (Unity). The last thing I added was the flowers buttons and twine. I used glue dots to adhere them all. Buttercup Buttons, Flax Paper Flowers, and Seattle Bakers Cording all from Amuse Studio! I just LOVE the way it turned out - and cannot wait to do another one! I am contemplating offering an art journaling bible study at our church and have been praying about it for a long long time! What do you think? Would you come to a class/study like that? I know I would love to attend one myself! It is not the creating part that makes me nervous it is the Bible Study part! I know God would lead me through it all - and I just need to lift it up to him and he will provide all that I need! I think I will talk to my pastors soon about it! This canvas was hugely inspired by a fellow artist. I have long been inspired by the works of Christy Tomlinson. Last year I took the plunge and took an online class with her and Junelle Jacobsen "The Art of Wild Abandonment" - I loved every minute of it! If I could I would take every class offering by both this amazingly talented ladies - but alas my time and funding does not allow that! Maybe someday! I shared this project at the February Stamping Night Out - and it was a huge hit! I wanted to make a case to keep a notepad in my purse out of the DVD cases we sell in the Amuse Studio Catalog. I love having a notepad - but hate how they get tore up in my purse! I started out with a Labels 8 Nestibilities and cut the largest die with Sugar cardstock. I stamped my flowers with Memories Tuxedo black ink and colored it with Copic markers. I then stamped my flowers onto regular paper and cut them out to make a set of masks for my flowers. Did you know that our Tombow Multi Glue makes AWESOME masks? You just apply some to your cut out mask pieces and let it air dry. It dries as a repositional bond! Then when you stick down your masks you can stamp away without slippage and remove them when you are done! LOVE! Once I had my masks in place I stamped my background leaves. I used Sage ink and the Beautiful Botanicals stamp set. I sponged on some Sage and Sky ink with Sponge Daubers. Next I attached the label to a piece of Buttercup Petite Dot Cardstock. I layered on a strip of sugar stamped with Sage ink and the Typeset Alphabet set. I slipped my cover into the DVD case then wrapped a piece of Lime Chevron ribbon around the spine and tied a knot. Inside my box I put a pen and a trimmed down Mini Legal pad. I happen to have a big cutter that I can cut the pads with - but you can also have them trimmed at your local office supply store. I trimmed about a half inch from the bottom edge and the right edge also to allow room for my pen! We have just a few days left of 30% off retiring list - shop now before it is all gone for good! I am looking forward to more studio time this weekend - so hopefully I will have more to share soon! Warm Wishes for the Blizzard of Oz! This card was one of my stamping night out projects featuring stamps and supplies from Amuse Studio! As usual you can shop for all the supplies and stamps in my online store! I started with a 4x5 1/4 panel of Winter Sky cardstock - and I stamped my snowflakes from the Let it Snow stamp set with Sky ink. Then I stamped the cityscape from the Love is in the Air stamp set on to Seattle cardstock. I trimmed it out and attached it to the Winter Sky panel with 3D foam adhesive. Then I tied a piece of Sugar Dot Organza ribbon around it and layered it onto a Sugar A2 card. Then to finish off my SnowScape - I added tiny dots of Le Pouf for falling snow. Le Pouf is like liquid Applique - you put it on and then heat it and it poofs up! You have to be careful because it really GROWS! My friend Mary had a BLIZZARD! Much like today in Kansas! I cut an oval using my Word Windows die and added my sentiment Warm Wishes - and attached it with 3D foam adhesive in the top right corner. Welcome 2013 - a calendar project with download! I always have loved making a new calendar for every year - so for last months Stamping Night Out I had to include a calendar project! I decided to try a new layout - incorporating a "quarter's" worth of calendar at a view. I also LOVE the idea of using an easel card for the form of the calendar. Since I am obsessed with everything Wasabi I had to include this color in my design and I decided to set it off with Blackberry. I also did a little something something for my ribbon - it is our Vanilla Twill! I tinted it with the Blackberry SPLASH! The easiest way to tint ribbon and flower like this and not wasting a ton of your splash is to sprint some into a ziplock baggie and then insert your item to be tinted and just smoosh it around. Alot less messy this way too! It does take a little time for the twill to dry - but I was surprised that it didnt take longer than 30 min - though this will depend on how wet you get it. I colored my vanilla pearl with a copic - V17 matched the best for me. If you don't know how to make an easel card it is super simple! I started with a 4 1/4 x 11 piece of Blackberry cardstock. Scored it at 2 3/4 and 5 1/2. Then Fold on the scored lines. On the inside of my card I layered a piece of 4 1/4 x 5 1/2 Wasabi Chevron cardstock and then placed my calendar towards the bottom of the panel. The calendar acts as the stopper for the easel. Then simply fold the top panel on your score line so it is like a tent over the bottom panel - attach your front panel only along its bottom half and voila! I hope you enjoy the calendar idea and download the PDF to make some yourself! I always make atleast half a dozen if not more Christmas cards every year for my stamping classes and I usually have a favorite that I make more of for my personal Christmas cards every year. This year I used a technique I have used many times before with varying supplies and outcomes - Reflection Stamping. I used a light ink so it is hard to capture on camera - hopefully you can see the reflected image of Noel. Here is my quick and simple video using Amuse Studio products! There are just a few days left to order from our Holiday Idea Book and Catalog! Shop on my site to get all the goodies before they are gone! And these are the last few days to sign up for just $29.99! PS - i hope you have missed me as much as I have missed blogging! I don't know how much I will be doing in the next year on here - but hopefully more than last year! My goal is to post atleast once a week - so we will see if I can make that happen! Have a blessed New Year full of God's perfect provisions for you and your loved ones! Today's card is super simple - just some white embossing which always looks great! I had leftover ovals cut out of the Bermuda Petite Polka Dot background paper - so I embossed right on it with the Sunny Side of Life stamp. We are counting down the days to the release of the Holiday Catalog and inspiration book - all the sneak peeks have been AMAZING! I actually have a pdf of it I can email you - if you are interested shoot me an email and I will send it out. It is a big file - so be prepared for it to take a bit to download! Our ball seasons all ended yesterday - so I am looking forward to taking back my evenings and going to the pool whenever we want! We have a week atleast before we head out on vacation. I am looking forward to just having more time period - which will hopefully translate to more stamping time and more blog posting! Yeah! 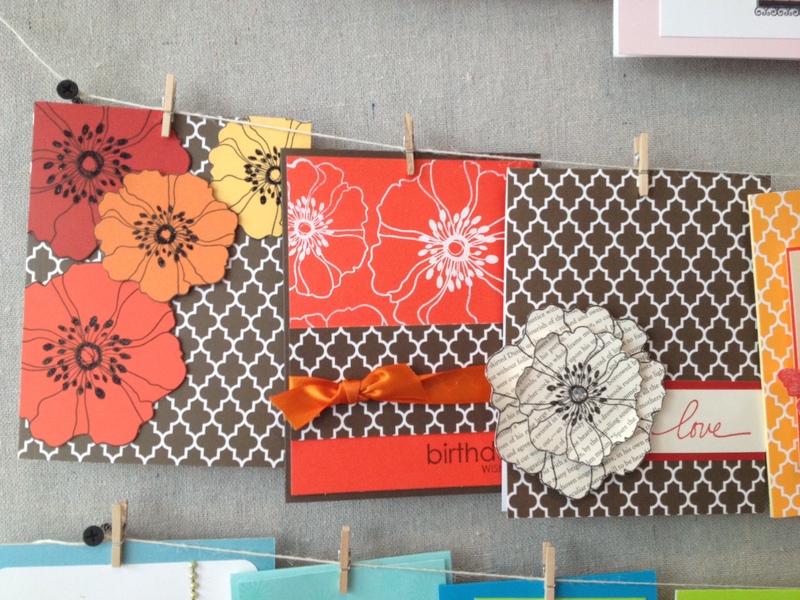 The Big 40 Nested Interlocking Flap card - video too! OMG I am actually getting back to my blog - and with a video and blog giveaway to kick off the fun!! I have missed it so - and I hope you all have missed me too! Let me know if you did by commenting on this post and I will enter your name into my drawing for some fun A*muse Studio goodies!!! Navy Wasabi and Pebble cardstocks - LOVE this combo very masculine! The cool thing about this card is how it opens - it is a standard Gatefold card - but when you open it - Voila! The nested shapes come apart and go to seperate sides - interlocking the card flaps when closed. Here is my video tutorial - short and sweet! For those of you who do not want to watch the video here it is in plain english - hopefully understandable! I started by cutting the navy frame - take any Nestabilities shape and pick 2 sizes that are atleast 2 sizes apart - in other words there is one that fits in between them. Use those two to cut a frame of your desired shape. Now take the smaller of the two and cut another shape with it. This is your nesting shape - because it fits perfectly into the center of the frame you cut first. Next you will make a gatefold card - Take a regular card piece and before you fold it score a line at 2 1/8 from the left side and the right side (along the short end) If you have a scorpal you will simply score at the two DOTS on the measureing line. Now you will simply attach your frame to the left side of the gatefold and your inside nesting shape to the right side of the gatefold. The easiest way to get the nesting shape perfectly inside is to attach the fram first - then CLOSE your card before adhering your shape - this way you can use the frame to determine where it needs to attach. Be sure that you only apply adhesive on HALF of your shapes - otherwise you will glue your cards together! Clear as mud? Hopefully the video helps! Big Top Birthday with A*muse Studio! a|s is still celebrating it's one year anniversary - and they are giving away FREE Polkadot Notecards with purchases over $25! You can order online anytime from my online webstore! (free notecard offer ends March 31 2012) I used the Bermuda notecard to make an inverted window card - where I punched out the oval in the card and then Layered the panel to the inside of the card with pop dots. The Under the Big top stamp set is also still on sale - as one of our Spotlight Specials! I colored the Ring Leader in with regular Tombow markers on this card - very simple but with a punch of color. I love how he fits perfectly with the words inside the oval. I cut the oval with my Nestabilities ovals. Before I layered my inside panel I tied a piece of Cherry Bakers Twine around the bottom edge of the card. Doing it before adding the layer allows you to "trap" the twine - so it will not fall off your card - and it is not visible on the inside! Cool trick - thanks Sherry for the idea! Here is a little of what I have been up to! I decided to take the plunge and take an online class. I have been on the fence about one - and the perfect class for me came along! The Art of Wild Abandonment by Junelle Jacobson amd Christy Tomlinson! I have followed Christy for several years - and one of my new years goals was to work in my art journal more - so this class was perfect! I wanted bright yellow tulips - so I took artistic liscence and did what I wanted! I do love the pink though and will definately be doing this again in pink! I started with a page in my are journal and I adhered torn up dictionary pages on top with Gloss Medium. Then I gesso'ed on top to sofetn up the text and prime the surface for my watercoloring. Then I sketched out my scene with a mechanical pencil. The I went to work adding watercolors - starting with the vibrant yellow first. I let that dry then added the green and blue above and below. I doodled and sketched around my watercolors with my doodle pen from Scarlet Lime. And I added white accents with my Signo Uni Ball pen from my store! I splattered on top with white and black inks. I am VERY pleased with how it turned out. This is actually my first completed piece from the class - I am a week behind because of internet issues! Blast! That is also why I have beem MIA on me blog! Some firewall thing or something - that I ask eric everyday - is it fixed yet???? I am still not able to get email on my computer - thank goodness for my phone! SO I hope you like my journal entry - and are inspired! This is my last card from my Under the Big Top marathon - to go along with the Spoltlight special and the sale on this set! For this one I focused on just the balloon stamp and continued with the Confetti Color scheme (Bubblegum, Papaya, Orange, Bermuda and Lime). I stamped it several times on my piece of Sugar cardstock and then colored them in with different colors of Copic Markers. Then I scallop cut the top edge using my Scallop borders die. For just a little fancy I tied a piece of Lime Grasgrain around the piece before I layered it to a piece of Bubblegum cardstock. Next I embossed my piece of Papaya cardstock with the Medium Dots Impression plate. I added all the layers to the front of a Bermuda card. Last I stamped and embossed in white the Celebrate greeting along the edge of the papaya piece. I have a huge to do list today - so I am gonna get to it! Hope you have a creatively blessed day! This month's Spotlight colors are "Confetti" - Bermuda, Orange, Bubblegum, Papaya and Lime! I used Papaya Bubblegum and Bermuda for this card - pretty cheerful huh? I loved the idea of using a little fliwer cut in half for her skirt - I spotted that in the New A*muse Studio Inspiration book and catalog! Have you got your copy yet? You can view the whole thing online - or get a realy copy for yourself just email me! I embossed the Bubblegum piece with the medium dots of the Tiny/Medium Dot Impression plate. Then I sanded it to reveal the white core of the paper. LOVE! I tied Bermuda tibbon arounf the Bubble gum layer before I added it to the front of the Papaya card. These and many more products are available in my A*muse Studio online store! Birthday Bash in March at A*muse Studio! A*muse Studio is celebrating their one year anniversay this month - Whoo hoo! I made this card using one of the stamp sets that is on special in our Spotlight - Under the Big Top. I started by stamping the Sugar card with dots from Polka Dot Patterns in Lime, Papaya and Bermuda inks. Then I tied a piece of Bermuda Satin ribbon around the card. I stamped the Ballerina with Tuxedo Black Memento and colored her in with my Copic markers. I layered that piece to a piece of Lime and added it to the front of the card with 3d foam adhesives. These and many more products available online in my A*muse Studio Store! Our Birthday Bash Promotion starts today! Host a Birthday Bash workshop in March and not only will they get the already amazing Hostess Rewards but they will also receive the Limited-edition Birthday Bash stamp set — Best Year Ever! That’s a $34.99 value. And if that’s not enough? All of her friends who order $25 or more will receive a free pack of Petite Polka Dot A2 Notecards! I have always LOVED Kraft cardstock. And I especially love it when you stamp on it with Eucalyptus! I made two cards with one stamping of the Sunny Side of Life flower sillouette cut in half - so you can really get some mileage out of this stamp! In any color it loks beautiful! This one I accented with a few Vanilla Pearls and I embossed the piece of Eucalyptus cardstock with the Dots embossing plate. I stamped my greeting from Essential Sentiments with the Eucalyptus ink. This one I tied a piece of Vanilla Twine around the stamped piece and I stamped the greeting on top with Navy Ink. I also stamped the Mesh Background Stamp onto the Eucalyptus with Versamark and I embossed it with Clear powder. I love the texture and depth it adds to the card! Today is the last day for retired products from a|s! And tomorrow starts their Birthday Bash! Host a Birthday Bash workshop in March and not only will you get the already amazing Hostess Rewards but you will also receive the Limited-edition Birthday Bash stamp set — Best Year Ever! That’s a $34.99 value. And if that’s not enough? All of her friends who order $25 or more will receive a free pack of Petite Polka Dot A2 Notecards! We also have the Sign up special going on thru May 15th! Hope you have a blessed day - I am praising God today for the sunshine! So I grabbed my watercolors and a big wash brush. I spritzed my Bristol pad piece of paper with water first, then brushed on blue and green for my background. Then I dried it with my heat tool and flattened it out under a large acrylic block. Next I layered it to a piece of Onyx cardstock and then layered that to a Sky card with 3d Foam Adhesives. Last I stamped my greeting from Essential Sentiments with Onyx ink. These and many more products are available anytime on my a|s webstore! I have two more cards from my studio time over the weekend - I will show you on wednesday! Super simple but oh so elegant! I just love this new set that I got from the new Inspiration Guide and Catalog from A*muse Studio! It is called Sunny Side of life. For this card I chose Amethyst cardstock for the base and I stamped with Heather ink. It is a tone on tone effect that is so stunning! I can see this card it every color of the rainbow - I am going to make up a set for my Mother-in-law and Sister in laws in their favorite colors. Today's card has been an experiment - will you let me know what you think by leaving a comment? I started with the flowers from Charming Garners from the New A*muse Studio Inspiration Guide and Catalog. I colored them with my Copic markers - and just LOVE the vivid red I achieved. The secret is really the addition of the BV23 to the shadow areas of the petals. For added dimension I wanted to add the stamens of the flowers with our Simple Stick powder and Papaya Flocking - also from the A*muse Studio Inspiration Guide and Catalog. So I grabbed my VersaMark ink and stamped them inside the flowers and sprinkled with SImple Stick Powder. Heated just til melted then sprinkled the flocking on top and shook off the excess. Now it was not exactly the look I wanted - so I also stamped right back on top of the Flocking with Papaya ink and the same stamen images. Wanting a little more detail I added just a few scribbles with my Copic Multilines .05. The vivid red paired up nicely with Bermuda and Black Polka Dot papers don't you think? I made the card base from Pebble cardstock so it is a soft grey - just to make the white pop even more. I am not totally convinced that I like the flocking on the stamens - but it is ok. I think because I loved the red flowers so much it makes the flocking ok! I am being uber picky I know! You all know how you feel when you are super excited to try something and it is just not as pesctacular as you wanted? That is what I am feeling. I still like the card though - and hope you do too! I did some major re-arranging on the old blog yesterday - I even figured out how to add the social media goodies to the footer of all my posts! I know it took me long enough, right? I hope if you are looking for anything on my blog you can find it easily! New colors - masculine maybe? I am in love with all our new colors - especially Seattle! I started with a seattle card and wanted to combo it with Pistachio. YUM! To top it off I added Rialto which is deep grey-green-brown. I stamped the same image from Mod Backgrounds 2 with Rialto and Pistachio- and stamped the greeting onto one with Rialto ink. Then I layered them to my card with 3d Foam Dimensionals. Last I tied French Roast Satin Ribbon around the whole thing - it ties them all together so nice! Working today in my studio designing for my upcoming workshops in March! I love doing this every month - and can hardly beleive that I have been doing it for over 13 years! Time flies when you are having fun I guess! I have a big announcement to make on March 1st - and I am so excited about it! It is something I have been considering doing for a long time and have just been mulling it over but now I am going to do it! Be sure to check back on the 1st! I see Chevrons and Cupcakes!! The Chevrons stamp set was at the very top of my list when I saw the new catalog last month - so of course they were on my first order! For this card I simply stamped one row of chevrons across the front of a white card - with Lime ink. Then I stamped a cupcake and frosting from the Hey Cupcake stamp set. I colored the cupcake with my copics - YG23 and YG25 for the wrapper and B000 on the cupcake part for a little shadow. After the cupcake wrapper had dried for a little bit I added some dots with the colorless blender. I stamped the Frosting with Bubblegum ink and cut it and the cupcake out. I added them to the card with 3D dinemsional adhesives and stamped the greeting below. You can always purchase these and many more products from my online shopping site! We had so much fun as usual on Saturday at my all day crop - and I even got a few cards made besides talking and eating! I am so blessed by that day every month! I was inspired by the Urban Wildflowers Pallette - which is our featured color palette this month! I substitued the Vanilla for Sugar - but I think they would be even lovelier had I used the Vanilla instead! I love the new Seattle color - it is a nice warm grey that is oh so trendy right now! The Lido is so luscious not too mustardy and not too bright for a yellow. And then there is always my fav Bermuda! You can get the Urban wildflowers paper pack thru the end of the month - which features 4 sheets of each color: Seattle, Pebble, Vanilla, Lido and Bermuda. It is just $7.65! I tone on tone stamped our Mesh background stamp onto the Bermuda layer - it is hard to capture in a photo but it adds a nice texture to the card. I know it will be a go to stamp for a ton of creations! You can see it just barely right below the knot in the ribbon. There are also more really light Bermuda flowers in there too. I love the tone on tone Chevrons on this card! They are so trendyright now - you will see them everywhere. I wished I had the Pinking edge dies - that would have really been a nice finishing touch for the edge instead of tearing - but I like the torn edge too. I am looking forward to an all day crop on saturday - they are always SO much fun! I have a few projects in mind to work on but will more than likely feel the need to pack my entire a|s collection so that I can play! I hope you have some craftiness in store for your weekend! Consider joining my a*muse studio team! The $50-75 stamp bonus with the starter kit makes a great deal even more awesome! Not to mention that a|s is a fabulous company to be a demo with! The support from the company is top notch - including tons of support with workshop ideas and even kits for workshops! They provide the projects and even samples if you want them! SO do not be afraid to take the plunge and give it a try. Email me if you want to chat about it! check it out! a*muse studio's NEW Sign Up special! Click the image then click on Start a Business to see all the contents of the kit - or email me for more info! Another Charming Gardner card - and new signup special! I am getting into the 4Bar size of card - have you tried them? I had not done them before I came to a|s - but I am loving the size now! It is a standard size - 3 1/2 x 5 - aqnd we sell sugar envelopes to fit! (shimmer ones too!) For this card I started with a piece of Bristol pad cut to 3 1/2 x 10. I scored it in half to form my 4Bar card. I stamped the flower from Charming Garders with Tuxedo Black Memento pad. Then I went to work with my waterbrush and watercolor pencils. I Edged the front of the card with the Scallop borders smallest die. Then to dress it up a little bit I added a strip of Bubblegum cardstock to the inside bottom edge of the card. For added texture I added a line pf pierced dots. Last I tied a piece of Bubble Gum Satin ribbon around the front of the card and stamped my greeting. The weight of the Bristol Pad really makes this card feel like a work of art! a|s announced another BIG promo for new consultants who purchase the DELUXE starter kit! The starter kit is already a fabulous deal at $225 - it contains over $385 worth of stamping and business supplies already! With this extra $75 that just makes it unbeleivable! If you have been thinking about signing up NOW is the time! Contact me to get all the details or for more info! I am having SO much fun with all my new goodies - and hope to share one of them with you on Friday! Word Windows - new Die set! My Word Windows dies arrived today - along with a bunch of other new goodies! I could not wait to use them - so I jumped in with the Floral Duets stamp set. I stamped with the new color Grape and Bermuda and ties a Bermuda ribbon around the piece. Then I cut out my word window and layerd that panel with 3D foam adhesive to the front of a Bermuda card. I love the look of the word window! We have so many sentiments that will fit into them or onto them! I have the piece I cut out now too - and I will use it on a card also! In the order I received today there was a backorder of the Floral Duets stamp set! It is crazy how fast they ran out of stock of this stamp set - which I am not surprised because it is so pretty. It should be back in stock in early March. Remember - you can order these any many more items on my site! The kids are home from school today - and we happened to have gotten a teeny weeny bit of snow - and they are out playing in it! I am sure Hot Chocolate will be on the agenda soon! I have the heat cranked here in my studio - and it took a long time for it to heat up to where I like it. So now I am off to play with my new goodies! Charming Gardners - another fav! When I forst saw this set I knew it would be a fav - isn't it gorgous??? I wanted to use the NEW Grapefruit color - and I paired it with Bermuda. LOVE this color combo! I used my Aqua brush and Tombow markers to watercolor the image. I stamped it on the Bristol pad which is a nice thick paper perfect for this technique. I scribbled marker on my acrylic block and used that as my pallette of color for my Aqua Brush. After it was colored like I wanted I let it dry then stamped the Script Background on top with Bermuda ink. I layered my flower piece to a piece of Bermuda cardstock - after I attached a knotted ribbon to the bottom. I textured 3/4 of the front of my card with a Polka Dot Embossing Pattern then I adhered the flower piece to the front of the card with some 3D Adhesive dots. All products can be purchased from me online at my a*muse studio store! I am anxiously awaiting the arrival of my premiere party order - it should be here on Monday! I am going to have to get all my work done so I can play Monday afternoon! This is a little Valentine I made while playing with my new stamps! This one was on sale last month - Quick and Cute Valentines. Lots of possibilities for some simple love notes. I used it on yesterdays trio also. I started with Our new color Grapefruit - it looks FAB paired with Vanilla and French Roast! I stamped on Sugar cardstock and cut it out with an oval Nesabilities. I colored with my Copics. I stamped the large dots from Polka Dot Patterns across the front of the card with French Roast ink. Then I attached the oval to the card with a 3d Dimensional and then tied a piece of Vanilla ribbon around the front of the card. Simple and sweet! All the products used on this card can be purchase anytime in my online shop! I have my cup of tea (Morrocan Mint Green tea this morning - YUMM!) and I am heading into the studio! I have a clean spot on my stamping table - and I am feeling inspired! These are three quick, clean and simple Valentines - all made with Nestabilites shapes. I used the Qucik and Cute Valentine stamp set and Love Conquers All stamp sets from a*muse studio - wich you can buy online from me in my online store! They are all really simple - two shapes together to form a card. My kiddos will be making up lots of these in the next few days to give to their friends at school. I had a great weekend - not any studio time at all - but even better! My anniversary was saturday and we decided to make it a family affair. We took the kids out to dinner and then to a KSU women's basketball game. Sunday we had Basketball tournament all day for Laney (they took 2nd) and then Super Bowl party! So Monday has come along rather quickly - and it is time to get to business! I got a new shipment of catalogs today - so if you would like one email me! They are $9.95 plus Priority shipping of $5.15. Thru the end of this week if you order one I will cover the priority shipping to you! This was my favorite make and take for my Premiere party last night - I just love this Technique! I was inspired by a card by Rita Holmes - which she made with three Christmas trees in place of the butterflies. She is such an inspiring stamper! I started with a Sugar card and I tore the bottom edge off. Save that piece! Then tear off about an inch wide strip. Stamp and color your three pieces - whatever they may be. Lay you card flat and then place the first strip you tore in place where it would go on the front of the card - lining it up with the bottom edge of the back of the card. Place a pop dot on the top and bottom of the opening - where you want to place your middle item. Then stick it down on top of the dots. Repeat for the remaining two items. Then layer a piece of colored or patterned cardstock inside the card - where the opening will show thru. I used the butterfly from the new Papillon stamp set - it is just lovely! We colored them in with copic markers to match the Bellini Pattern paper used on the inside of the card. We also stamped the greeting with Celebrate in Style with Bellini ink. I topped it off with a Piece of Orange Satin ribbon. Aren't they lovely??? Oh the coloring possibilities! It is such a fun card - and really easy to do! My Premiere party last night was SO much fun! I gave away over $300 in prizes! We also started a new round of Hostess club that will start next month and run thru July. I still have open spots if you are interested email me! I am off today to Junction City - we are having a llittle Valentine Make and Take at my friends shop Hobby Haven. It should be a super fun day! New creation with new products! I feel a new favorite color combo coming on...Pistachio, Seattle and Titian! Especially the Titian and Seattle - they will go well with so many colors as the accent! I started this card off with a Pistachio card. I stamped the background stamp from Mod Backgrounds 2 with Seattle and Titian Ink onto sugar pieces then cut them out and inked the edges. Layered those onto the card. (there is a little gap inbetween them under the elephant layer) Then I stamped the elephant from Under the Big Top with Memento Tuxedo black and colored him with copics. I used the blender to make the polka dots on the headdress and rug on the elephant. I tied a piece of Onyx Bakers twine around the piece between the sentiment and image and layered it to a piece of Seattle cardstock. Then I attached that to the front of the card with 3d Foam Adhesive. I would have never thought that I would NEED a circus set - but this one is FAB! I have heard from alot of people that it is on the top of their wish list too! Tonight is my big premiere party - and it is going to be a BASH! I am giving away a TON of prizes - including $$ to spend in the new catalog! I love premiere night! I have a bunch of things to do today for tonight so I better get to it! Don't forget - if you need a new catalog just email me! Or you can view it online! It is called Floral Duets - and I am in LOVE! I hope you like it too because I am sure that I will be using it ALOT! For this card I started with the new Grapefruit cardstock. I matched up my copic's to match - and they do match perfectly! I also matched up the yellow to the new Lido cardstock. I really like these two colors together. I added a little finishing touch to the flowers by adding Crystal Clear Glaze to the flower centers. It really makes them POP! If you are not into coloring so much - the set also includes a solid image for the two size flowers - so you can stamp them in a color instead. Sweet! I stamped the large dot border from Polka Dot Patterns along the edge and embossed with clear powder. I layered the flowers to the card - using 3D Foam Adhesives only on the center flower. Then I stamped the sentiment on a strip and flagged the end. And added it to the card with 3D Foam Adhesives too. I just Love this card - it is so striking! The new Grapefruit color is going to be a new favorite too! It is kind of a coral-ish pink that is not too in your face hello I am pink! So today is the first day of our new catalog! If you have not pre-ordered one from me by now you can still get one for $10 plus shipping. You can also view it online as a pdf until your first order and then add the catalog on - to save on shipping $$. Just be sure that if you wish list is long you email me - hostess benefits may be in order! Masked sun scene - on the wing again! Today I am sharing another card I made for the design call for our National Conference. It is an elusive one layer card! I know I have trouble keeping it simple and making a card with just one layer of cardstock. This one packs a punch with masking! I started out with a circle punched out from a Post it note. Apply it to the card where you want the sun to be. Then using a sponge dauber and Papaya ink sponge around the post it. Then remove the post it and stamp the bird on top. This one I used Cherry ink - and I did another one with Eucalytus and it looked great too! Then I stamped the foliage and the words with French Roast ink. I love the sentiment with this set! Tomorrow is the last day to order from the current catalog - and Wednesday is the first day to order from the new one! I got my pre-order things today and have been having fun playing! I have a huge list for my next order too! I am off to stamp some more! We are still on the fence today - this time with the butterfly trio dies and a little glitter! I cut three butterflies - two from Orange and one from Orange Gingham cardstock. Before I cut the smallest butterflu though I stuck a piece of Super stick tape on top of the cardstock - so that when I cut it I could peel off the protective layer and simply sprinkle glitter on it! You can also use Red-line tape - which we will be carrying in the new catalog! Next I made my fence piece woth the Sca;;op dies and a piece of sugar cardstock. Once cut I ran it thru my corrugating tool (boo hoo we do not carry one!) I attached my fence to a piece of Sky cardstock. I also cut a piece of Fern cardstoc with the grass die - and attached it to the bottom of the fence. I folded all the butterflies in half and then attached them just by the spine of the fold with some Tombow Multi glue. I attached the sky piece to my card and then added the sentiment and some piercing along the edges. Clean and simple card - not much stamping but it pack a nice punch in texture and dimension with the corrugating, piercing and glitter! SO on my agenda today - everything I didn't do yesterday! :-) I am still playing with my new goodies for my premiere party next week - and anxiously awaiting my order with even MORE goodies! In the meantime I actually have a huge jewelry order that I have been putting off for way to long that I need to tackle - so I will probably spend most of my day doing that! Less than a week is left to order from the retiring list - and till the new catalog goes LIVE! This must be one of my favorite stamp sets because I am using it all the time lately! On the WIng - I stamped the birds with Eucalyptus ink and cut them out. Then I took a strip of sugar and scallop cut one edge and then ran it thru a crimping tool. (we dont have one but hope they will add one SOON!) I attached that piece to the front of a Sky notecard. Then I cut a piece of Fern with the grass die and aqttached it to the bottom of the card. I attached the birds on top of the fence with 3D foam adhesives and stamped the greeting with Onyx ink. For a little finishing touch I tied a piece of Onyx Bakers Twine to the top of the card. I have another card with this fence idea that I will show you tomorrow! In the mean time I am working on stuff with NEW Products that I brought home from conference! I am saving it all for my premiere party on the 2nd - so I won't be sharing any new stuff til then! You still have time NOW to order from the retiring list though - I was lucky to only have 1 set retiring - but I had a list of ones I wanted and am SO glad to have time left toi get them before they are gone for good!! If you are like those birds on the card and on the fence about a*muse studio - don't be! I have heard that from so many people about signing up to "do this". I am still floating on cloud nine after our National Conference! I met (and got to know better) some AMAZING women and am SO excited for the journey we are on together with a*muse studio! It makes such a difference to me to have others with me on the journey! We can inspire each other and build each other up - and even push each other! And even better is to get to know the behind the scenes people at the company and their character and ethics. It means alot to know they have integrity and honestly first and foremost in everything they do. It means alot to me - and I can go forward passionately promoting a*muse studio with confidence! If you are looking for a way to do what you LOVE (stamping!) and make some $$ - this is it! I am telling you they make it easy - way easier than it has ever been for me before. If you want more info email me! I am gonna go back to stamping now...:-) That is after all what this is all about isn't it? Aren't they sweet? :-) I decided to name the birds in this and yesterday's cards Wassabi and Pebble just to be silly. This was a prototype for my swap card for National Conference - and I decided on yesterday's design because of time! On a piece of Sugar cardstock I used the On the Wing stamp set for the birds (embossed in black) and the Beautiful Botanicals set for the branch (with Wasabi Ink). I layered the Sugar piece to Onyx then Wasabi - with a larger edge on the Wasabi layer. Tied a bit of Onyx Bakers twine around the hwole thing and it was ready to add to the front of the card with 3d Foam Adhesives. Then I used the Harlequin Impression plate on the Pebble card and sanded it to reveal that yummy white core paper! You can order any of those items from my online store anytime! If you need help - or if your order is over $150 email me so I can get you the extra $25 in Free product you get as a hostess! I am digging in today and getting caught up on all things a|s! I am planning some super fun things for my Premiere party on Fabruary 2nd! I have a long to do list! this is my card that I made for "trades" at the a*muse studio national conference in New Orleans this past weekend. I am in a wasabi phase lately and do not see any end soon! Maybe the new colors coming out will lure me out? They are amazing! . I can't wait to get home and creating with all the goodies we got! I used Beautiful botanicals and On the Wing plus words from Woodland Friends. Tied it up with Onyx Bakers Twine and layer my Wasabi to a Pebble card. pretty simple but I love it! I am flying home from NOLA today and am in Houston on a little layover right now. It is so nice to be able to blog a little! I am coming home with lots of new stuff - including all of our new ink pads! We got a sheet of all the new papers too! Plus some stamps of course so I am itching to get in my studio this afternoon. we had such a blast in NOLA - a|s did a fabulous job on their first conference and they knocked our socks off with the new catalog! We have 40 more pages of awesome stuff! Here are some of my favorite things that are at the top of my wish list! exclusive spellbinders dies - boxes flowers and so much more! Venetian Palette - inks paper and ribbon too! and so many stamps sets! Charming Gardeners and Floral Duets are at the top! if you want to order a catalog I am still taking pre-orders for $10 postage paid priority mail to you. That offer ends at the end of the month so be sure to order soon! I should have them by the end of the week and will be able to mail them out by Friday I hope. I was apprehensive about the new catalog and if they would add enough to their product line to keep my attention and they did! We got lots of images to color with copics which was my#1 request.. I am so impressed with them as a young company. They are on the right track and I am so happy to be along for the ride! If you are still considering giving amuse a try as a demo we should talk! They are very business minded and are setting things up to make it so easy to do what you love and actually make money doing it! Leave me a comment and I will get in touch with you! we had the biggest team at conference which makes it all so much more fun. I was a proud mama! I was also awarded the rising star award - whoo hoo! It is because of my wonderful friends that it was made possible. Thanks guys! I am looking forward and planning some fun stuff for my team and customers this year! battery is getting low - hope you have a blessed day! I am looking forward to a creatively inspired 2012 - even more now that we got such a fabulous catalog! Three of my fab cards off the display boards! Check out my Facebook page for all the deets on the new a muse studio catalog! I am Heather Wendell Scott -add me as a friend and see all the fun! I love vellum - and stamping on it with our a*muse studio inks is just DIVINE! It has a velvety matte look to it that I just love. On this card I used slate ink. I then stamped on a Slate card with Onyx ink with the same ornate elements stamp for a background. I paired it up with the Silver Damask Shimmer Couture pattern paper. The slick shiny of this paper is an awesome contrast to the velvety matte vellum. I added a little Onyx Bakers twine and that was the finishing touch it needed. Vellum can be tricky to adhere to you card - but this card uses a real easy trick I like to use to attach vellem so the adhsive cannot be seen! You simply layer a strip of paper OVER your adhesive! You have to plan it out a little - but if you strategically place your adhesive behind the vellum it works like a charm! A simple trick for attaching vellum! I am opff to our first day of a new Bible Study - we are starting the 2 Peter Precept study - and I am excited for what the Lord has in store for us! Hope you all have a blessed day! I had a SUPER weekend - starting of with an all day crop with some of my favorite people. (we missed you guys who could not come this time!) TONS of food, inspiration and fun! I even got my trades done for National Conference! I am excited to be heading to New Orleans this thursday - and will not be home tim Monday! I will have the a*muse studio new catalog in my hot little hands - and hopefully some awesome new stuff to play with too! We are staying at the Omni and having our Gala at Antoines! Oh la la! Now what to wear??? I am struggling in this area but know that it will all work out just fine! Since we have a new catalog coming out - we have retiring lists! One for stamps and one for products - and they will only be available til the end of January! SO if there is anything on there that you are in NEED of - let me know! You can shop online or email me your order. What can I say I am in a rut? I am liking the rut though! Satin Pearl embossing powder - YUMM! Today I paired it up on Amethyst cardstock and it is STUNNING! I stamped the Ornate Elements in a column down the center of my card with VersaMark ink and them embossed with Satin pearl. LOVE it! I stamped the lady in slate onto Sugar cardstock that I cut out with the labels die set. I layered it to a slate oval with some 3d dimensionals. Then I accented the corners with Onyx Twinkle Stickers. I tied a piece of Onyx Polka Dot ribbon (which is currenty on back order - boohoo!) around the card centering it along the column of Ornate Elements. This would be a great card for Mother's Day or a bridal shower. Even a birthday or congratulations! I left the sentiment out of the center for now so I can stamp what I want inside when I need it! It's Friday! My card today is a real simple one - with a little copic coloring, an amuse exclusive die cut, Onyx bakers twine, Blush cardstock and more Satin Pearl Embossing powder! The neat thing about the Satin Pearl powder is that you can maipulate the color of it by the ink color you choose to stamp with! On this card I used Currant ink! Here is another shot so you can see the embossing. I used only 4 copic markers to color the berries - YG03, R85, R89 and N1 for shadows. I just LOVE the satin pearl embossed Currant ink and the Blush cardstock! I squished and played with my paint yesterday - so fun! Today I am going to do a little shopping and go visit with grandpa! I am having a hard time motivating my son to do anything before noon - so hopefully he will get going this morning and go check on job applications! The boy needs a JOB! I love Kraft cardstock - and the Satin Pearl Embossing powder totally rocks on it! I stamped with Ornate Elements and embossed with Satin Pearl embossing powder - first on the Vanilla layer and then on the Kraft . I made the pocket with a 3 x 8 1/2 strip of kraft simply cut both ends with Labels 8 Nestibilities (we do not carry this die but hopefully it will be in the new catalog!) You can slip a gift card or note in the pocket - use your imagination! The flower is the Flax shape flower with a Cranberry button tied with Vanilla twine - BOTH those products are on the retiring list! So if you want Cranberry buttons or Vanilla twine - email me and I will order some for you! Or you can shop online anytime on my secure shopping site! So yesterday turned into a black hole - you know the one where you spend way too much time on your computer?? Well that was my yesterday! But today I am not going to let that happen again! I am off to CREATE! And actually in the midst of writing this post I got a phone call and created a card while I was on the phone! That I will save for tomorrow... More Satin Pearl embossing! YUMMM!!! It is not like it is horrible or anything - but it was not what I intended at all! Have you ever started to make a card and then you went off in the weeds and messed it up? Well that is how I got to this creation. It still needs help but I had to throw in the towel and call it quits. It is a nice one layer card though - and I do currently love everythign with Cherry Bakers Twine tied on - so it does have a few things going for it. This card was a runner up for my class last week. I used Blush cardstock and ink paired up with Cherry cardstock, bakers twine and ink. I used the smallest scallop border die to edge the cherry layer - LOVE! The words are from Essential Sentiments and the hearts are from Hearts a Plenty - which is on the retiring list so if you want it you better get it now before it is gone for good! The Cherry Bakers Twine is such a great addition to all of your Valentines day cards and treats! I just tied it around the layer and placed the bow in front of the red heart. New Catalog coming out SOON! A*muse studio release Feb 1! Order before Feb1 and I will cover the shipping for you! Today's sketch is pretty basic - I could not beleive I had not done a sketch like this before when I went through my archive! I use this layout alot - and know that alot of stampers do too. I had planned to use an old sketch but had to make one instead. I am going to use an edge die on the middle layer - just to jazz it up a bit! Amuse released their retiring products over the weekend - Boohoohooo.... :-( I am SO sad to see some of these things going away - but am also looking forward to what they will have new in just a few weeks! Check it out - and if there is anything you need get it quick - email me or shop online! Once their supply is depeleted the item will no longer be available. I am so excited to be working in a CLEAN studio. Well mostly clean anyway! I have one corner to organize - and I am going to make it a permanent scrapbooking corner! One that I can leave things out - like the layout I am currently working on. I am hoping that by having it out it will get me to get all these pictures scrapped! I also hope that my family will get in on the journaling and memories! Sounds like fun huh? Not super crazy about this card - but it was something I wanted to try. I die cut the hearts with our hearts die set and then attached them to the fromnt of my card. The stamped the zig zag from Mad for Plaid set with Onyx ink on top. I accented the stitched with the Spica glitter gel pen but you can't see it in the photo. Add sentiment and heart twinkle sticker and voila! Not sure what I could do different to make me like it more! I did accomplish my goal of getting an entry in my art journal done yesterday - yeah! It is funny how I just want to creat but when i get there I am hesitant to do it! Wanna see?? I started with dictionary pages decoupaged to the page. I gesso'd over top of them and you can barely see them now - but i like the thickness it gives to the paper too! Then I scribbled on watercolor crayons and sprayed with a fine mister and blended it all in with a big wash brush. Then I went to my stamps and inks! I used the circles and birds from Clever Girls and the foliage from Beautiful Botanicals 1 and 2 plus the cloud from Rock Star. Oh and I also added in the medium dots from Polka Dot Patterns. I used Blackberry, Fern and Slate inks plus Stazon Black for the birds and Stazon white for the polka dots. Then I doodles and wrote some words with a sharpie pen. I really enjoyed the process - and am looking forward to doing LOTS more this year! The goal is atleast once a week - maybe more! As usual all supplies and stamps are available in my online shop! Be sure you sign up for my monthly newsletter in the sidebar too! Here is a card that I made for my class last night. I wanted to use the mini clothespins - they are so cute! I started with a piece of Winter Sky cardstock and I embossed it with the swiss dots cuttlebug folder - I don't have the a|s impression plate which has 2 sides one tiny and one medium dots! I die cut the heart from Cherry cardstock and two clouds from sugar cardstock. I stamped the clouds with the script background using WInter Sky ink and attached them to the Winter Sky piece. Then I attached a piece of Cherry Bakers Twine at an angle across the piece. I used a 3d foam adhesive to stick the heart down then attached the clothespin. I mounted the piece to the front of a Sugar card with 3d Foam Adhesives then stamped the greeting below. SO I am trying to figure out what is on my agenda for today. I have some little messes in my studio to tidy up - but then I think I am going to get my jewelry making things out and get crafty! I have a special order to make - and then I REALLY need to get things added to my etsy shop! The cupboards are bare there - and I have been thinking that I really need to get better about adding stuff there regularly! Right Annette??? :-) Today is the day! But first I have a date with my art journal! Here is my second attempt at the Canvas project - and this is the one I gave in our gift exchange. I used basically all the same stamps and inks as yesterdays canvas - with the addition of Polka Dot and Gingham papers! Here you can see some of the details - grateful for the everday was the saying I chose for this one. Can you see I embossed the script background on the yellow of the house? It is with Satin pearl Embossing powder - but it doesn't show up very well. Laney's canvas is coming along - she added some painting yesterday and all she has left now is the doodling! When she finished it up I will make sure it is ok to share hers so you all can see it! She is excited to hang it on her wall in her room. I was talking to my mom yesterday about when I was younger and drawing. I have a memory of drawing those "Art Instruction School" art tests - remember those? They were in our newspaper I think - lots of places I think. I remember drawing the turtle first and then another time doing the pirate and the bear. I asked my mom how old I was the first time and she said I was 6! Her and I sat down together to draw the turtle. My drawing was really good - mom said better than hers and alot like the test image. That was the beginning of my love of drawing and art in general. I did not think I was so young - I was thinking 10 or so like Laney. I will have to get the drawings from my mom next time I am home. 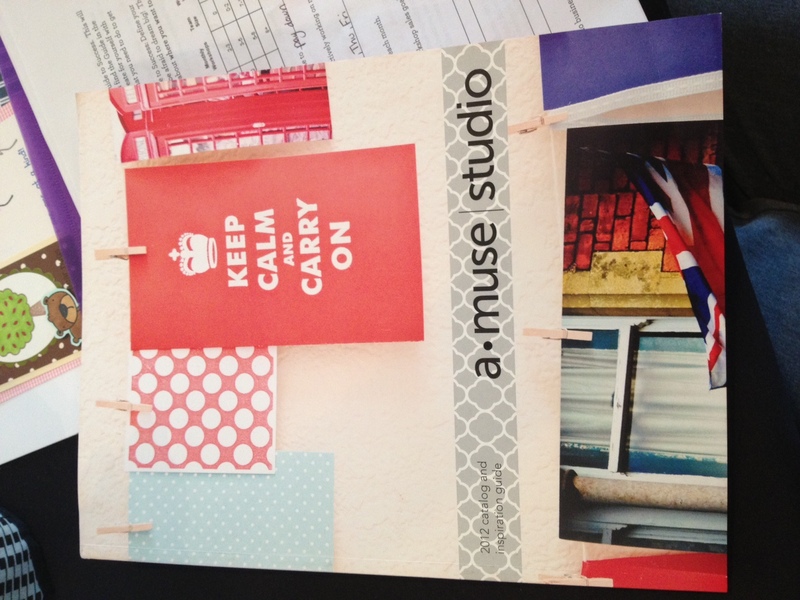 We got sneak peeks to the new a*muse catalog that will be out at the end of the month - so exciting! Besides new stamps - we have new colors too! Don't forget to email me to pre-order a new catalog so I have one for you ASAP! I am a Life Artist - who enjoys creating and sharing her passion with new people. On Scallop Note Center Cuteness!